We took off for an extended Labor Day weekend on Thursday and are staying in San Luis Obispo. The agenda for the weekend is pretty open, except for a couple of wine-related stops, of course. 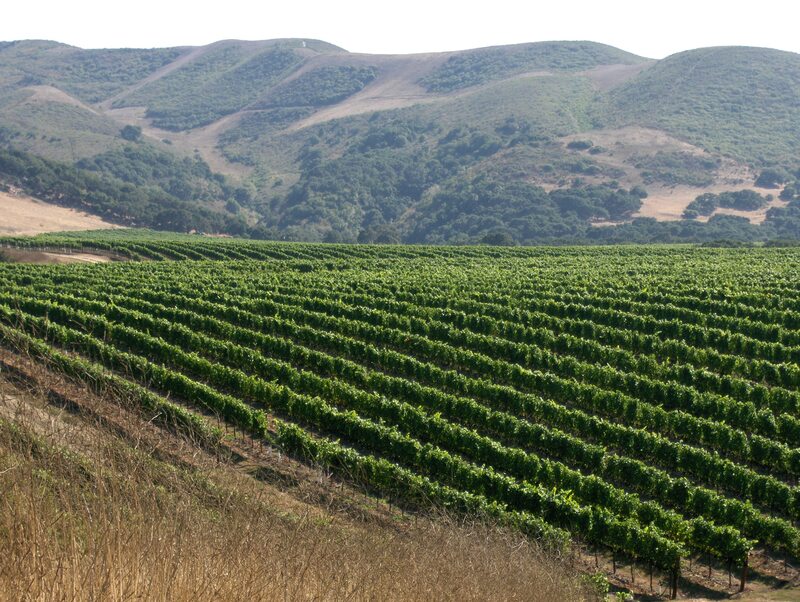 Knowing that we would be staying relatively close to Santa Barbara County, we wanted to stop by and visit one of the vineyards from which we are sourcing Pinot Noir grapes – La Encantada vineyard in the Santa Rita Hills AVA, near the town of Lompoc. Harvest is fast-approaching, so we were anxious to see how the grapes were doing. I arranged a meeting with the vineyard owner, Richard Sanford of Alma Rosa Winery. 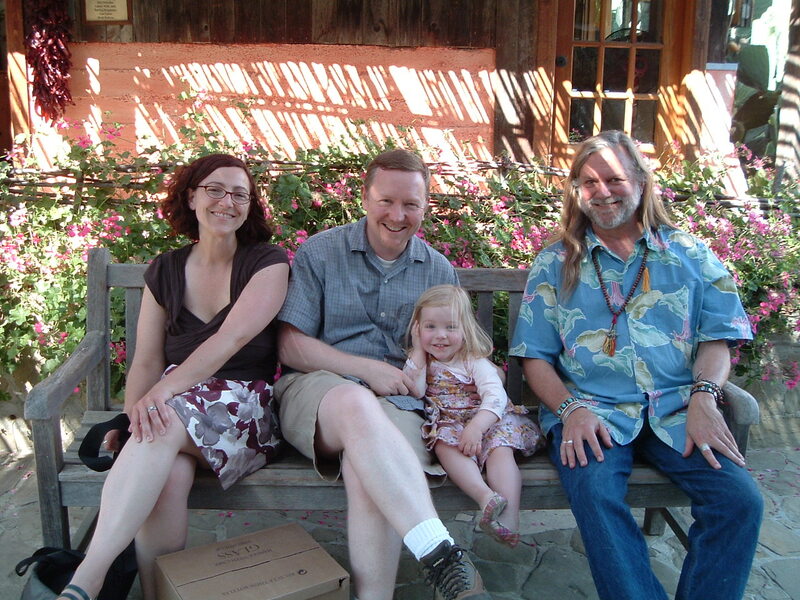 Richard and his wife Thekla own the winery and the three surrounding vineyards. 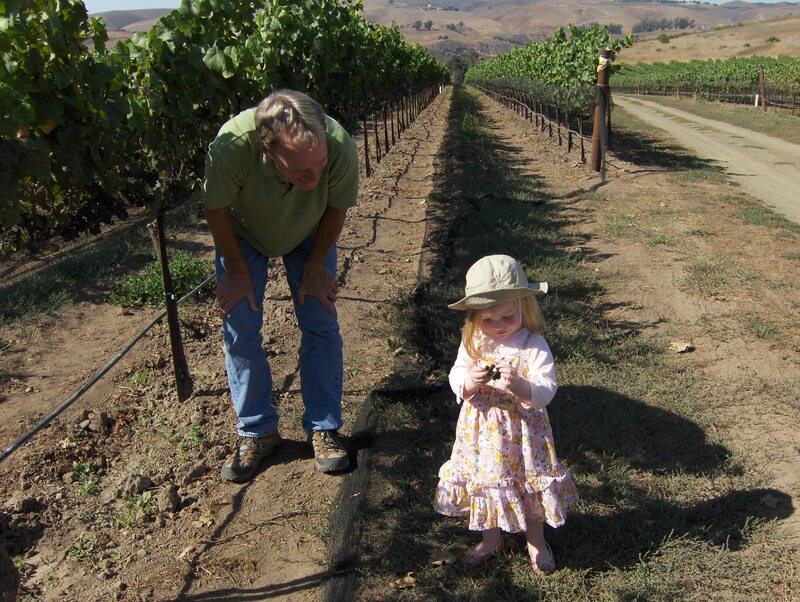 Richard was a Pinot pioneer in Santa Barbara County, combing the region almost forty years ago looking for ideal growing conditions for the Burgundian grape. He literally drove around with his thermometer, trying to identify cooler regions where Pinot Noir would thrive. He identified a prime region where the valleys run east-west and the cooling influence of the ocean breezes would temper the heat of the day. And thus began the wave of grape-growing and winemaking in Santa Rita Hills. Richard was nice enough to take time out of a busy Labor Day weekend and drive us around the vineyards. It was hot – in the 90s down at the winery. We made three different stops, each one providing a perspective on the vineyard and the careful planning behind its design as well as a perspective on the entire region. He pointed to Sanford & Benedict vineyard, the first vineyard he planted in 1970. At the next stop, towards the top of the hill, where it was beginning to cool off, he motioned towards the gap where the ocean breezes and fog rolls in. We looked right and saw where Sea Smoke and Fiddlehead have their vineyards. The results are impressive. We tasted the grapes and they are coming along quite well. The clusters are small, due to the low-vigor conditions. Great flavor, acidity and tannins – it looks like the 2008s will have similar structure and flavor profiles. 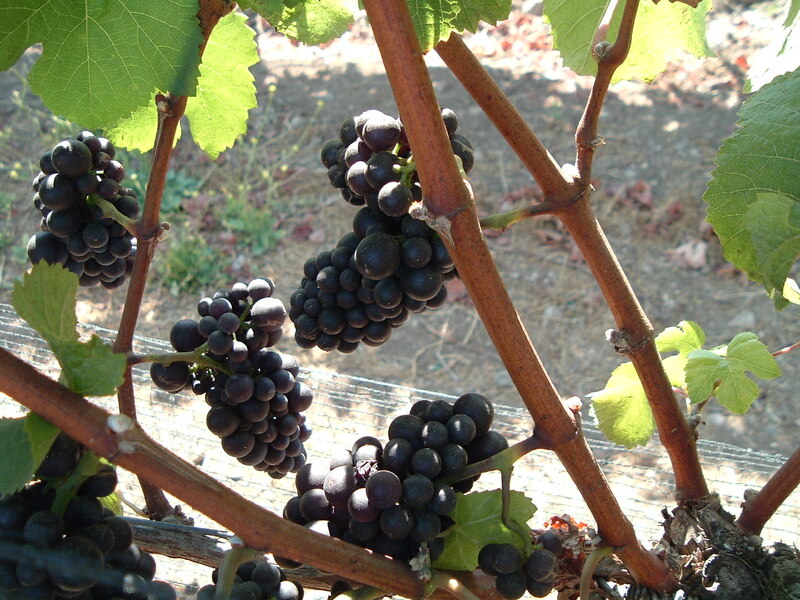 The 2007 growing season produced similarly small clusters. Even our two-year old loved the grapes. She kept on asking Richard for “more grapes, please!” He even pulled out a tiny little cluster for her to pick from. Richard explained some of the basic growing techniques – north-south rows and leaf-pruning around the clusters to provide maximum exposure to the sun, with a high vertical trellising to provide a nice canopy as well. While dry-farming would align well with the organic philosophy, the region doesn’t get enough rain throughout the year to support that method, so they use drip irrigation. It was an honor and a pleasure to get a personal tour from Richard and experience his passion first-hand. We’re even more inspired about our own winemaking dreams and thrilled to be able to make wine from the Sanfords’ grapes. We hope to be creating our own take on La Encantada Pinot Noir for years to come. We started our visit to La Encantada with a stop at the tasting room at Alma Rosa Winery. You may recognize the tasting room and the tasting room manager, Chris Burroughs, from the movie Sideways. Back then, it was the tasting room for Sanford Winery, and it was the first stop on Miles and Jack’s rollicking, yet dark, tour of Santa Barbara County. Fortunately, the old, rustic tasting room followed Richard and Thekla as they moved on from Sanford Winery to start Alma Rosa. 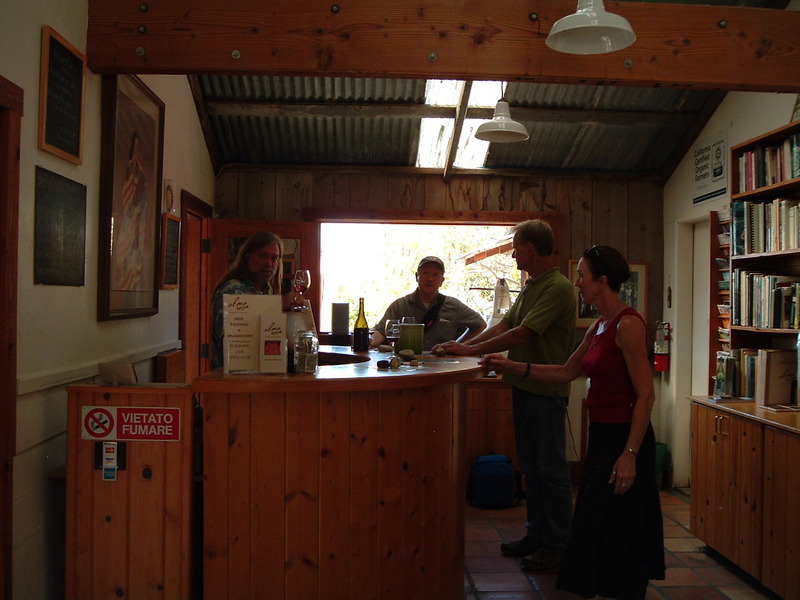 We also met Nancy, another tasting room expert, who poured a number of different wines. They were all very helpful and patient with our energetic two-year old. We enjoyed all of the wines, and took a particular fancy to the Pinot Blancs (from Sta Rita Hills and La Encantada), the Vin Gris of Pinot Noir (a beautiful copper-pink color, with nice plum and strawberry notes – not your everyday pink sipper) and of course the Pinot Noirs. The 2006 Santa Rita Hills Pinot Noir is a blend of different clones from La Encantada and is fruit-forward, with a nice plummy nose and a silky palate. The 2006 La Encatada Pinot Noir has a darker, brooding side – more balance between earth and fruit, solid structure. All of them were fantastic wines and we definitely took home a few bottles. 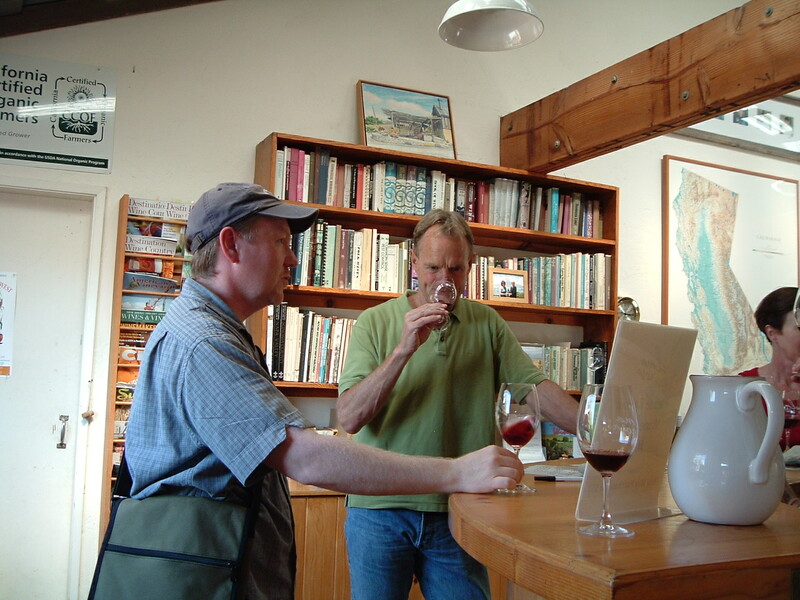 I was eager, yet nervous, to pour our own 2007 La Encantada Pinot Noir for Richard and for anyone else who was willing. We had just bottled it less than a week ago, so the nerves were directly related to fear of bottle-shock. I actually uncorked the wine about two hours previous, just to let anything residual blow off. It was tempting to pack the decanter, but that’s overdoing it. The excitement came from seeing if our efforts pleased the king, if you will, and at the minimum, were representative of the vineyard. Luckily, there was a brief lull in the tasting room and we had the place to ourselves. So Richard had Chris pull out a few glasses so the tasting room crew could try the wine as well. Much to my relief, the wine was doing quite well upon its fresh bottling. The smokiness on the nose was well integrated with the fruit and cola notes and the fruit had some good staying power on the palate. Better yet, we got a positive response from all. They all enjoyed it, Richard noting that it was “lush,” and Chris noting the nice smokiness. We raised our glasses and toasted our collective efforts. That, my friends, was a particularly cool moment. It totally rocked – ‘nuff said. Okay, so while this seems like a complete ode to Miles and Jack, honestly, we didn’t plan a Sideways pilgrimage. The movie is, of course, one of my favorite movies. And Miles’ soliloquy on the essence of Pinot Noir certainly can move one to tears, if not to a glass of the nearest DRC handy. But we never really attempted to trace their steps along the wine trail. We’ve always mapped out our own wine trail, no matter where we are. But given that we had an afternoon in the Santa Rita Hills and I knew we’d be hankerin’ for a hunk of something, it was obvious that I had to make a reservation at the Hitching Post II in Buellton. This, of course, is where Miles and Jack sidle up to the bar, order a glass of the Highliner, proceed to dinner and encounter Maya. So with our two-year old in tow, and the bar already packed with a mix of locals and star-struck tourists, we were headed to our own table. 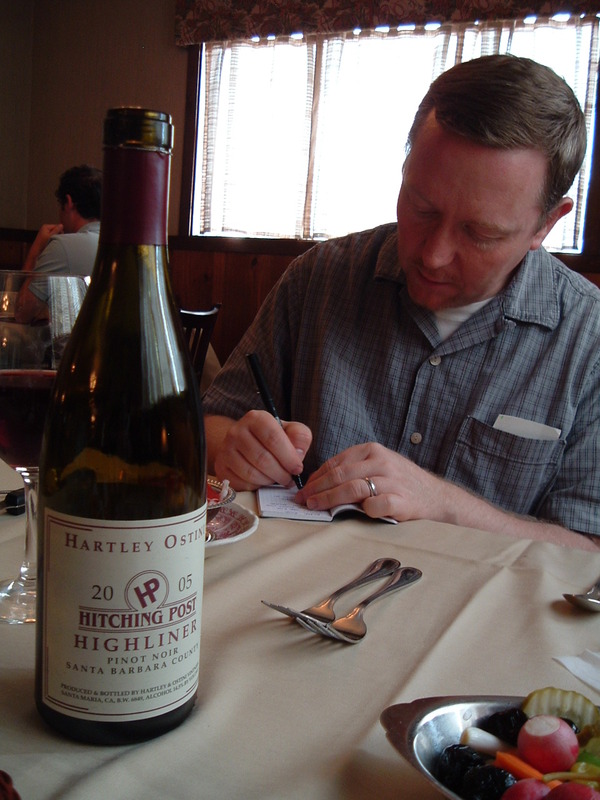 But we did order a bottle of the 2005 Highliner, Hitching Post’s own Pinot Noir from Hartley-Ostini, along with our steaks. A flatiron for Jennifer, a New York strip for me. I was tempted to order the “St. Rita’s Earth” Pinot from HP, but figured I might as well see what the Highliner was all about. It was billed as “full, round” and it was definitely a big Pinot. Big enough to work well with the steaks, but still a Pinot, not a Pinot-in-Syrah’s-clothing. Well, close. The funk and mushroom on the nose are what I like, but in a blind tasting, that could have passed for a southern Rhone wine. The fruit was very much Pinot and on the darker side. Baked cherry with lots of concentration – a ripeness that bordered on a raisin-like quality. At first, I got some tanginess, almost a little zip. That eventually smoothed over and gave way to a fairly long palate. Our two-year old had not napped that day and had been dragged all over creation by her parents (in and out of the car seat at least 10 times that day), so our time was limited. We wolfed down our salads, but savored the steak and the wine, in between some coloring books and trips to the potty. Ah, the life of the parent trying to squeeze it all in. Well, we promised her a trip to the beach the next day, so hopefully that will make up for it. 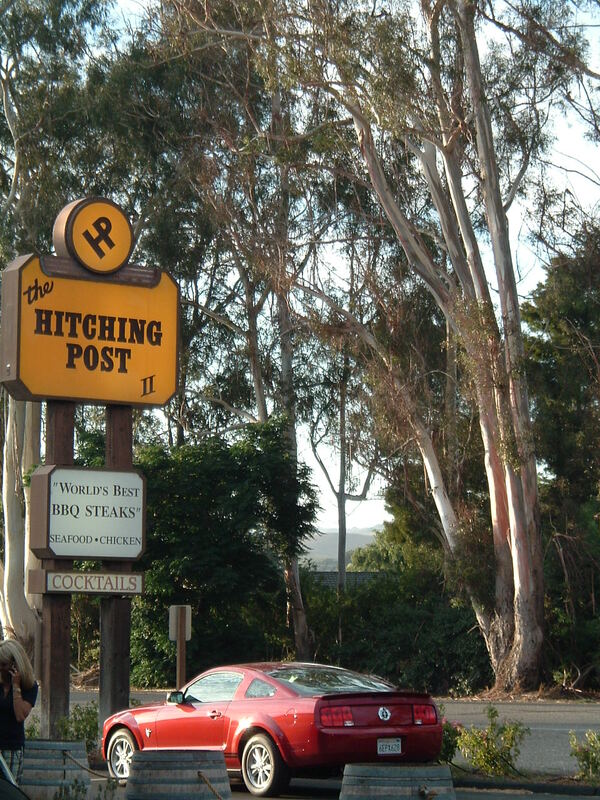 But a trip to the Hitching Post was definitely a fitting end to a very exciting day in the greater Buellton-Lompoc area. At long last, our Waits-Mast 2007 Pinot Noir wines, from Wentzel and La Encantada vineyards, are in the bottle. It was a family affair as Jennifer, our daughter and I rose early for an 8am Saturday morning start (we’re not really morning people around here.) After some searching for our corks, we got going with the Wentzel and then the La Encantada. We each had a taste of the wines before they got some sulfur and were bottled. Unfortunately, our labels are not ready, so we’ll have to come back to label the bottles in a few weeks. The wine at this stage often has bottle shock, so we will not be releasing the wines until November anyway. For tasting notes, see our previous post, below. Our two-year old toasted with her own “wine” and entertained the cellar rats at Crushpad with her interpretive dancing. It was gratifying to finish this process and realize that our first official launch of legally-available for sale wine is just around the corner. Yikes! We’re working on updating our website and will have a webstore up soon, so stay posted. Until then, keep an eye out for updates on events and other news from Waits-Mast. In July, I went into the winery for one more barrel tasting and to do a little blending. Crushpad always makes extra barrels of wine from each vineyard for topping and other purposes. That means that there are usually different variations of the wine, like different clones or different barrel treatment. Last year, someone had made a single barrel of Hein Vineyard Pinot Noir in 100% new French oak. For that wine, it was too much oak and was not drinkable on its own. I actually got to add a very small percentage to my 2006 Hein, which needed more oak at the time of bottling. This year, I had the luxury of blending small amounts of other different clones. Most large-scale winemakers blend because they can – they have multiple barrels to play with. I only have one of each vineyard and they are in totally different appellations. But, I did have the ability to blend in a small percentage, usually around 5% of another wine from the same vineyard. We’re making two barrels of Pinot Noir for 2007 – one from Anderson Valley, the other from Santa Rita Hills. The Anderson Valley is from Wentzel Vineyard. At a several hundred foot elevation that overlooks Goldeneye in Anderson Valley, this organically farmed vineyard is owned by Roland Wentzel. It is about 10 acres and was planted between 2000 and 2002 to clones 115, 667 and 777. I tasted our 07 Wentzel with our winemaker Chris Nelson and this wine is really showing well at this stage of the game. It has a medium to dark ruby color with darker fruit dominating the nose and palate. We blended in another clone of Wentzel, I believe it was a 115. It had brighter, red fruit notes and delivered just a touch of candied fruit and also provided a smooth mouthfeel. Overall, this wine is going to be a great fruit forward, yet balanced, representation of Anderson Valley Pinot Noir. The fun thing about making two different barrels is just that – you can really see the different representations of a varietal like Pinot Noir. Our 2007 La Encantada Pinot Noir from Santa Rita Hills (Santa Barbara County) and has a base of 115 clone. It shows more smoke and spice on the nose, some good tannins and a deep ruby color, leaning towards crimson. 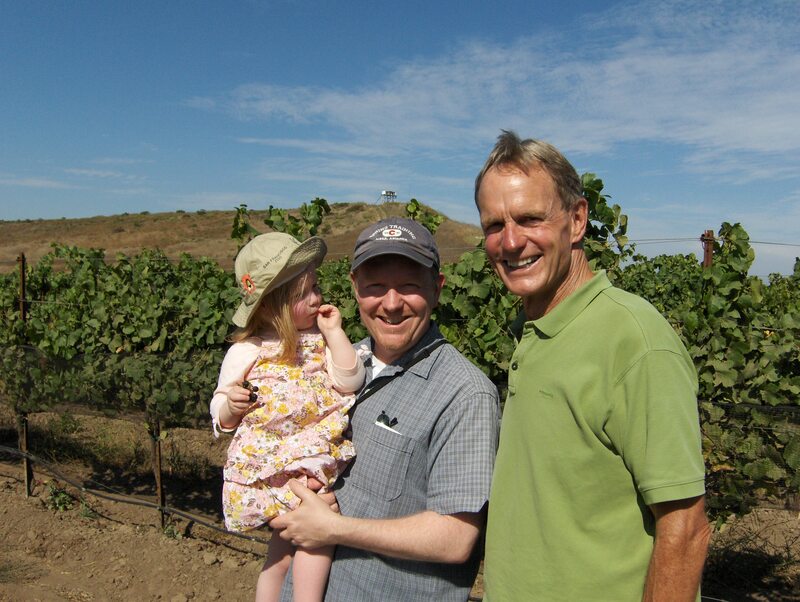 The vineyard is owned by Richard Sanford (of Sanford Pinot Noir fame). Richard and his wife started their own winery, called Alma Rosa, and also make a single vineyard Pinot Noir from this vineyard. Chris and I played with some different blends, adding in varying percentages of 667 and 777 clones from other La Encantada Pinots. I think we tried four or five different blends, keeping a control sample to our left…or was it to our right…things were getting blurry after a while! In the end, we went with a blend of 8% 777 and 2% 667. The 777 added the spice and more acidity, while the 667 added some more tannin and structure. The result was sweet cherry, spice, floral notes and a hint of cola. The La Encantada has great structure and I think will be a wine that will age well. Yes, you read that. Heirloom tomatoes, Delfina culinary treats, Franciacorta Italian sparkling wine and Kosta-Browne Pinot Noir…all in one evening! Last night, we decided to partake in Heirloom Tomato Week in San Francisco. A number of restaurants in the city are participating in it and have select menu items celebrating the seasonal variety of tomato. For us, it was an excuse to get a babysitter and go out to dinner. We saw Delfina on the list and decided to get a reservation there. We used to live around the corner from Delfina when it first opened almost ten years ago. In fact, I remember running into Delfina to buy a baguette (for a dinner I was cooking at home) because Bi-Rite was closed or out of them. That’s how unknown Delfina was at that time. It was probably a Saturday night and it was not that crowded. And it was probably Craig Stoll (the owner) that was behind the counter that sold it to me. I would never think of doing that today! And we hadn’t been in awhile because…well, because it’s no longer a small neighborhood restaurant – it’s a destination restaurant and reservations are hard to come by. But, hey, we know it’s awesome, so we went for the 5:30 reservation – a dinner time we’re used to given that we have a 2-year old daughter. Since we don’t get out to restaurants as often as we used to, we tend to blow it out. Hence the Franciacorta *and* the Kosta Browne. We went for 1/2 bottles – a great way to go if the couple dining has different tastes. After a long day with a nap-less child, Jennifer was ready for something sparkly. We hadn’t tried Franciacorta and decided to give it a go. Franciacorta is Italy’s take on Champagne and uses both Chardonnay and Pinot Nero. I don’t remember the particular maker, but it is from Lombardia. It was elegant – a great balance that you enjoy with a Champagne. Yeasty, restrained fruit, a little smoother than your average bubbly. It paired well with the Heirloom tomato salad I had (with fresh stretched mozarella) and the salt cod mantecato (like a brandade) that we shared. For a more intense dish like that, the acidity really cleared the palate. When we were at Delfina years ago, we had a very memorable gnocchi – it was with a simple, light cherry tomato sauce and was sublime. It just melted in your mouth. No other gnocchi has compared to it, ever since. So we had to revisit the gnocchi scene at Delfina. We had the gnocchi with ragu. It was classic Delfina – very much “of the place.” That same velvety smoothness of the pasta that we remember with a classic rustic slow-cooked ragu. Mmmmmmmm. It really deserved a Barbera or Chianti, but we ordered a Kosta-Browne 2006 Russian River Valley Pinot Noir to go with our “secondi” – hanger steak for her, roast Fulton Valley chicken w/chanterelles for me. Russian River Pinots can sometimes be bigger and can hang with steaks pretty well. We were also keen on having the Kosta-Browne because they make Pinots (blends and single-vineyards) from the Amber Ridge Vineyard in Windsor. Waits-Mast has a 2005 Amber Ridge and will also be making a 2008 Amber Ridge as well. So, we were interested in comparing and contrasting. It did not disappoint. The aroma was beautiful – full fruit with a little bit of Asian spice. It had a very fresh and ripe taste to it, but not overbearing and not too big. Definitely more fruity than your average Pinot, but not over the top. It worked well with our dinners and was yummy. We finished every last drop. And while the half-bottle price was still kind of high, it’s at least easier to swallow that a full-bottle price. As we finished off the Pinot, dessert arrived. We ordered the chocolate torta with olive oil gelato and Maldon sea salt, but were also treated – compliments of the kitchen – to the panna cotta. A good friend of ours, Alyssa (who is our web site designer, too) used to work there and another friend Eric is now working there…helps to have connections. Our server Adam was great as well – gave us lots of attention, answered all our food-geek questions, etc. Sigghhhh. Okay, I think I’m going to heat up those leftovers!